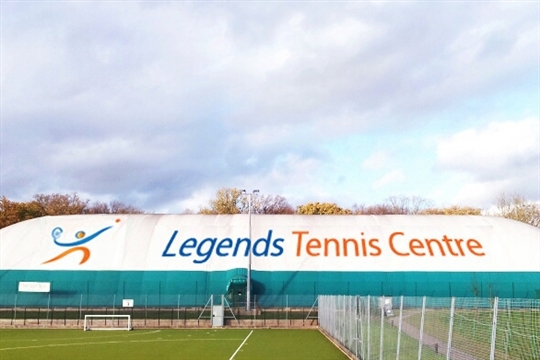 The Legends Tennis Centre houses a vibrant adult and junior coaching programme with club membership on four Grand Slam quality indoor and four outdoor courts. We are situated on the beautiful grounds of Haileybury just a 5 minute drive from Hertford. The facility boasts great viewing areas of both the indoor and outdoor tennis courts, a coffee shop serving freshly ground coffee and a range of hot meals, a sports massage therapist and a pro shop selling all you could need for your enjoyment of tennis. Please give us a call: 01992 476880, e-mail us: play@legendstennis.co.uk or better still, come and visit us - please see the map below. All our memberships are now available to buy on line. Please go to the Membership tab and scroll down to the bottom of the page.